JOHN DRURY CLARK (1907 - 1988) was an American rocket fuel developer, chemist, and science fiction writer. In addition to his work as a scientist, he was instrumental in the broad revival of interest in Robert E. Howard’s Conan stories and an influence on the writing of Isaac Asimov, L. Sprague de Camp, Fletcher Pratt, and other sci-fi authors. ISAAC ASIMOV (1920 - 1992) was an American author and professor of biochemistry at Boston University, best known for his works of science fiction and for his popular science books. A prolific writer, he published more than 500 books, most notably the science fiction novels I, Robot and Foundation, and the popular science works, Guide to Science and Understanding Physics. "Read this book. You’ll find plenty about John and all the other sky-high crackpots who were in the field with him and you may even get (as I did) a glimpse of the heroic excitement that seemed to make it reasonable to cuddle with death every waking moment—to say nothing of learning a heck of a lot about the way in which the business of science is really conducted." "This insider's account of the early years of rocketry captures the excitement of researching and developing technologies that lie outside the realm of computer science. While we're accustomed to think of technological progress in terms of Moore's law, in a few short years these engineers went from launching metal tubes small enough to hold in your hand to propelling a two ton metal capsule containing three humans all the way to the moon." "A good book on rocket stuff...that's a really fun one." "Ignition! 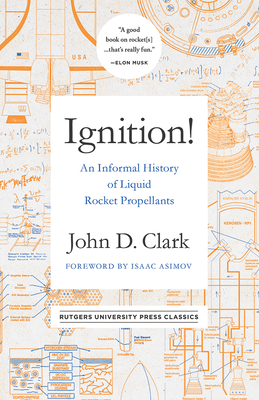 is a hard-to-get-your-hands-on account of early rocket science...Clark was an American chemist active in the development of rocket fuels back in the 1960s and 1970s, and the book is both an account of the growth of the field and an explainer of how the science works." "Ignition! is a history of liquid rocket propellants, but it's also a history of cold war and the space race, told from a particular point of view....That humor helps the accessibility, and as long as you remember some high school chemistry you shouldn't have a problem with the science either." "Ignition!, originally written in 1972, is back in print after a long hiatus. A classic book, it tells a rollicking story of an era when space was the frontier. An informative history, it reads like an adventure story."